Roar! 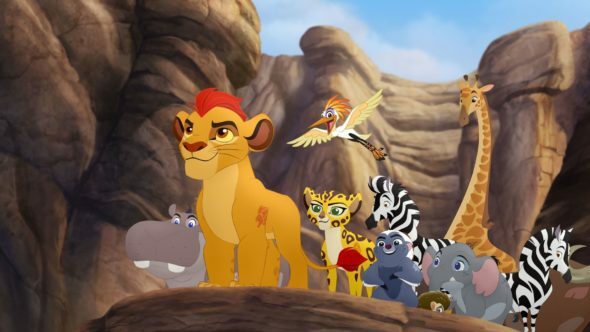 Disney Junior has renewed The Lion Guard TV show for a third season. Season two of the series will premiere in the summer. The Lion Guard voice cast includes: Rob Lowe, Gabrielle Union, Max Charles, Joshua Rush, Atticus Shaffer, Diamond White, and Dusan Brown. Expect Renée Elise Goldsberry and Kristofer Hivju to guest star in season two. Disney Junior has ordered a second season of 2017’s #1 series among preschooler-targeted networks, “Mickey and the Roadster Racers,” which since its January premiere, has reached over 41 million viewers nationwide. Disney Junior, geared towards kids age 2-7 and the #1 preschooler-dedicated network for the past five years, has also ordered a third season of its popular animated series “The Lion Guard.” The announcement was made today by Nancy Kanter, executive vice president, Content and Creative Strategy, Disney Channels Worldwide, and general manager, Disney Junior Worldwide. “Mickey and the Roadster Racers” is a madcap car-racing adventure series for preschoolers that takes Disney’s #1 star, Mickey Mouse, and his pals Minnie, Pluto, Goofy, Daisy and Donald, along with their unique transforming vehicles, on humorous high-spirited races around the globe, as well as hometown capers in Hot Dog Hills. Off the racetrack, Minnie and Daisy also run their own successful business as Happy Helpers, solving problems for anyone in need of a helping hand. The stories are designed to impart social and emotional lessons about friendship, teamwork, optimism and good sportsmanship. The Emmy-nominated creative talent behind Disney Junior’s hit series, “Mickey Mouse Clubhouse” and “Jake and the Never Land Pirates,” comprise the production team: Rob LaDuca is executive producer and Mark Seidenberg is co-executive producer and supervising story editor. “Mickey and the Roadster Racers” is a production of Disney Television Animation. “The Lion Guard” continues the epic storytelling of “The Lion King” and follows the adventures of Kion, the second-born cub of Simba and Nala, and his diverse group of friends as they unite to protect the Pride Lands. Ranked as 2016’s #1 series across preschooler networks in Total Viewers and Kids 2-5, season two of the series will debut this summer and feature new guest star voices including Renée Elise Goldsberry (“Hamilton”) and Kristofer Hivju (“Game of Thrones”). “The Lion Guard” voice cast includes: Rob Lowe as Simba; Gabrielle Union as Nala; Max Charles as Kion; Joshua Rush as Bunga; Atticus Shaffer as Ono; Diamond White as Fuli and Dusan Brown as Beshte. Ford Riley (“Special Agent Oso”) is executive producer and Howy Parkins (“Jake and the Never Land Pirates”) is co-executive producer and supervising director. The Education and Science experts at Disney’s Animal Kingdom theme park serve as consultants and author and Swahili expert Sarah Mirza is the language and cultural advisor. “The Lion Guard” is a production of Disney Television Animation. What do you think? Has your family been watching The Lion Guard TV series? Will you check out season three on Disney Junior? Let us know, below. The Lion King was the very first movie I watched in a cinema. I’ve watched all the movies and series. TLG is certainly interesting, I watch it with my nephew on Netflix. I hope there’re more than three seasons that are able to explain Kion’s absence in SP. Yea I know!! I really like the lion guard, and I don’t want season 3 to be the last season!! i am so so so so so so happy i cant wait !!!!!!!!!!! I hope season 3 is aired soon as I am too excited!! IKR LIKE PUT IT BACK!!!! !